XDA Recognized Developer Chainfire presents his latest app TriangleAway. 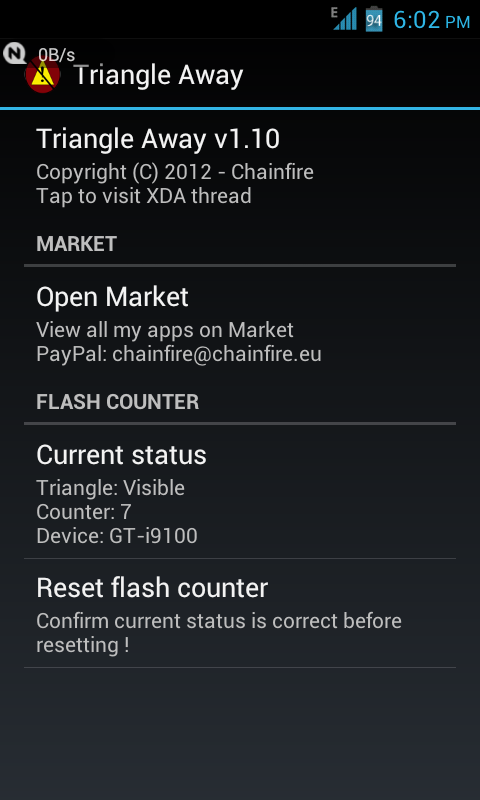 The tool will give you the option to reset your flash counter and remove the yellow triangle by coding the bootloader. Use it only on rooted devices with Android Ice Cream Sandwich as it´s operating system. The flash counter and triangle state had to be stored somewhere. Everybody knew that. Guesses have been made in the past where it could be, and I have personally compared the raw flash disk contents between different amount of custom flashes in the past, unable to find any differences. You can dump and compare the entire /dev/block/mmcblk0 and you won’t find a difference (you’ll find a few unallocated and unused gaps, though). Soon as more official ICS firmwares become available, much more devices will be able to use this interesting tool which should be used for experts only, as it can potentially brick your expensive toy. Please leave your feed back to developer and thanks for reading.